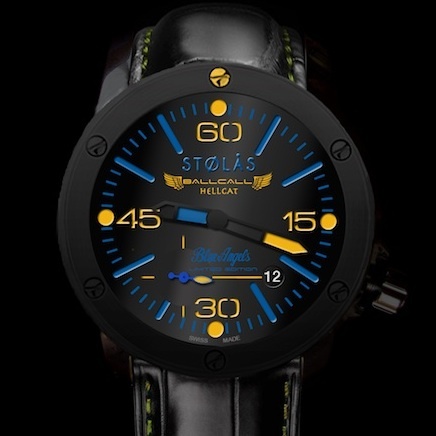 Naviator™ Hellcat - Blue Angels Automatic - STØLÅS Watch Co.
Click the button below to add the Naviator™ Hellcat - Blue Angels Automatic to your wish list. 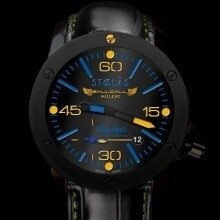 STØLÅS Watch company specialized in Maritime Instruments meaningwatches for the sea. When brain storming for our next collection we wanted to make a pilot model but needed to stay within our Maritime styling. Thus came forth the BallCall™ (now named the Naviator™). When you think Naval Aviatorsonly one group comes to mind, the US Navy’s Blue Angels.Our special limited Angels editions harness the complexity and bold form of the Angel’s planes and flight suit and maintains the precision these Ball Callers require to continue it’s position as the greatestaviation demonstration team in the world. just another fine example of craftsmanship. I have two other harbormasters and im sure this wont my be last!